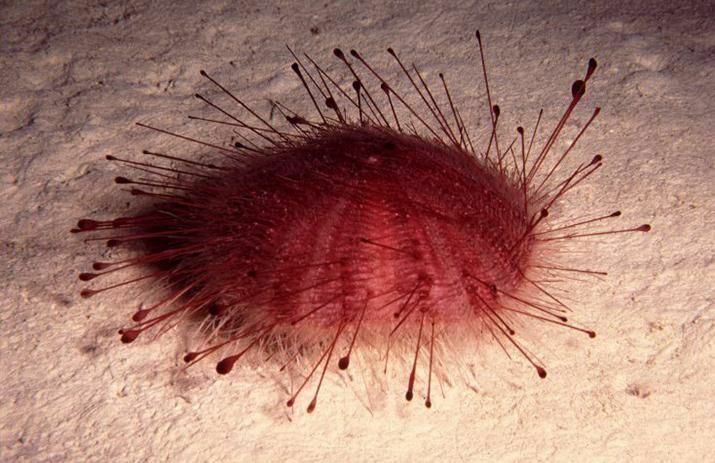 This animal looks like a pincushion. But you would not find it in a sewing kit. This venomous sea urchin is also called A. belli. It lives on the ocean bottom. It lives as deep as several thousand meters. Scientists study it and other deep ocean dwellers. They use submersibles. They also use remotely operated vehicles (ROVs). These vehicles explore the ocean depths. They are equipped with cameras and collecting gear. Ole Theodor Jensen Mortensen was one such scientist. He was a Danish zoologist. In 1938, he described the stomach contents of relatives of A. belli. It had been brought to the surface by a trawling ship. He was not able to observe the animals alive in their deep habitat. But the remarkable observation of plant material inside their bodies led him to propose that some sea urchins were vegetarians. These individuals had apparently fed on plants. These plants had broken off from shallow sea grass beds. Or they floated down rivers. Then they drifted down to the deep sea. Echinoderms also include sea stars. They include sea cucumbers. They include brittle stars. And they include crinoids. They have diverse body shapes. Those reflect the range of marine habitats they occupy. They may occupy shallow reefs. Or they may occupy the deep ocean bottom. Sea urchins do justice to the name. Echino means “spiny.” And derm means “skin.” But other echinoderms may be soft. They may be smooth. They may be feathery. Or they may be bumpy. What they all have in common is a body with five-part symmetry. This is obvious in a five-armed sea star. But it is hidden under the skin of a sea cucumber. Austin Clark described nearly 500 new species of echinoderms. This was in his later work at the U.S. National Museum. Today, scientists continue to study echinoderms. They probe mysteries about their life histories. Zoologist Dave Pawson works at what is now called the National Museum of Natural History. He combines data from many sources. The sources include museum specimens. It includes research at sea. And it includes observations of live animals. He uses the data to see what echinoderms reveal about life in the deep sea and its connection to shallow-water habitats. Learn more about his discoveries in a "Smithsonian Science How" webcast video. 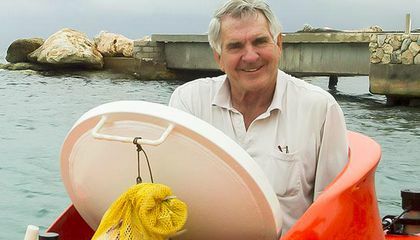 It is called “A Century of Discovery of Sea Urchins and Relatives.” Dave will take you on a historical research journey. You can also get teaching resources to use with the webcast. The animal was poisonous. They could make themselves look less poisonous them they appear. It was more difficult because back then they didn't have submarines or ROVs so they couldn't go down that deep because of the eminence pressure.